A vertical opening, two leaf door hinged horizontally at approximately centre position with side trundle fitted to each leaf, capable of moving in vertical guide channels fixed to the building at each side of doorway. 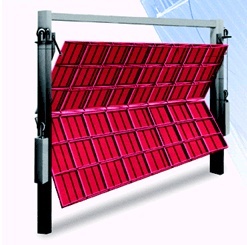 The door to be suitably counterbalanced with solid counterweights by connecting the door and counterweights through the medium of flexible steel cable moving over a pulley system fitted to the guide channels or building to suit the individual requirement. The door movement to be controlled by a single simple link on each side of the upper leaf with one end pivoted on the door and the other end pivoted on the guide channel or pulley heading, so that in the closed position the door is in line and upright and it then moves to an open, folded virtually horizontal position under the lintel. The unique design and construction of the door has ensured success and allowed us to supply to some of the largest warehouse groups, Industrial buildings, manufacturing buildings, commercial buildings, recreational buildings, residential buildings, hangers, engineering companies, distribution organization, petrol stations and fire stations ( Balai Bomba ) in Malaysia.